Clerodendrums are a large genus of shrubs and woody climbers that occur on four continents. C. trichotomum var. fargesii is an upright bushy shrub or small tree whose leaves give off a strong odour when crushed, which some people identify as beefy and others dislike vehemently! It also produces white heavily scented flowers with red sepals in mid to late summer. 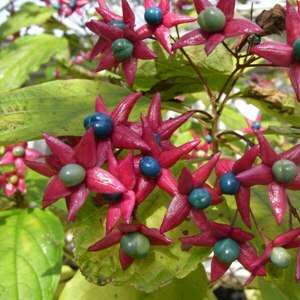 The flowers are followed by dazzling bright blue fruits that contrast with the red fleshy sepals, making them attractive to birds for seed dispersal. It can be grown as a specimen plant but not in a formal area as it will sucker and spread. This is a good two season plant stunning autumn fruit colour following pretty white flowers in late summer.